There is cultural significance in sneakers. Beyond wearing a shoe for comfort and function, some people wear certain brands and silhouettes because they symbolize a popular adoration for sports, music, creativity, and style. Some people have accomplished great achievements in their shoes that the footwear itself becomes historical in-line with the person's legend. Heroes like athletes Allen Iverson and Michael Jordan, musical talents like Pharrell Williams and Kanye West, as well as genius Steve Jobs all triumphed in their Reebok, Jordan, adidas, Nike, and New Balance sneakers respectively. Factors such as these, along with special colorways and limited collaborations with exemplary design houses, make many sneakers attractive to wear and valuable to collect. Frequent curator of art exhibitions in the Pittsburgh area Sean Beauford expounds sneaker culture with his new forum. "GRAIL abandons the idea of sacred material possessions, reconsiders consumption, and urges thoughtful creating," is written at ongrail.com. Through an exhibit and panel discussion, artists John Geiger, Dylan Graves, LinShuttr, as well as entrepreneur Soley Ghost, and moderator Grits Capone underline the significance and complexity of iconic shoes, nicknamed after the Holy Grail. GRAIL's cast mates all have their own contribution to or appreciation for sneaker culture. John Geiger's imagination has led him to craft many unique designs with Nike's Air Force 1 and his own collection of footwear. Artist Dylan Graves offers an abstract representation of Jordan Brand's beauty while illustrator LinShuttr plays into MJ's icon. Soley Ghost is the proprietor of a couple sneaker shops, like East Coast Boutique in New Jersey. Poet and journalist Grits Capone will concentrate the conversation on an all-encompassing culture. Establishments in Pittsburgh's East Liberty support Beauford's GRAIL and GRAIL TALK. The Kelly Strayhorn Theater presents the show, and sneaker consignment store Refresh PGH sponsors the affair. Music by iB-Rease will aid the atmosphere. GRAIL will open on Thursday, October 13 at Ace Hotel, also in East Liberty. Discussion will be held from 6-7 p.m. and after the gallery will unveil. While working on his own footwear label under his personal moniker, John Geiger continues to push contemporary style and Pittsburgh heritage. His crafty work with the Nike Air Force 1 sneaker, and imaginative designs admiring his hometown, the city of Pittsburgh, reach broad appreciation. Previously linking with other creative forces in the Steel City for a two-day pop-up shop selling items unique and exclusive to the metropolis, Geiger again sets Pittsburgh, Pennsylvania on a pedestal. This time, partnering with Premium Co., a fashion label based in Washington D.C., Geiger offers another pop-up shop and some detailed sneakers. Held at Ace Hotel in Pittsburgh's East side, Geiger and Premium create custom Air Force 1 Low and adidas Stan Smith, respectively. Both pairs are clean white with text and graphics inspired by Pittsburgh lasered on. Geiger's shoe, called the "New P Logo," features a hand depicting the letter P with the thumb, index, and middle fingers, as well as the phrase "For Pittsburgh By Pixburgh John Geiger '16" on the outer heels of the shoes. The toe box on the pair makes the map of Pittsburgh. Also, Geiger presents a black and white version of the Air Force 1 Mid model. Premium Co.'s delivery, "Burned Bridges," depicts burnt bridge planks as the adidas three stripes logo, plus "Premium Pixburgh '16" and "Burned Bridges" font and illustrations on the outer heels. Keenly, Geiger and Premium use the nickname "Pixburgh," a slang and cultural reference to the city, in both their creations. It is a testament to their smart design and attention to the popular nature of The City of Bridges. In addition, view Geiger's progress with John Geiger Collection here and shop Premium wear here. The fashion labels' pop-up shop will take place August 5-6. Shoe sizes 7-14 are available. Streetwear retailer Supreme and athletic apparel giant, Nike pair to produce a new version of the Air Max 98 sneaker. 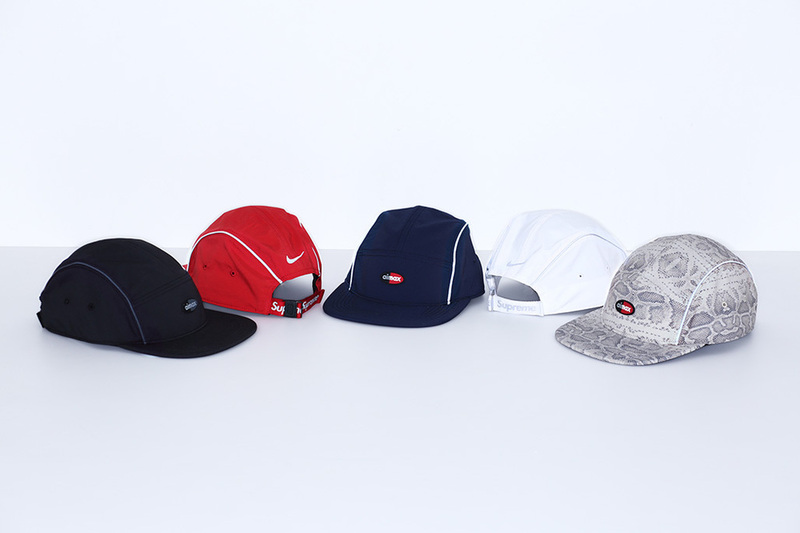 The brands' collaboration, including the footwear featuring snakeskin, red, navy, and all black colorways with metallic, reflective mesh uppers, will offer a Dri-Fit Running Hat in five color options. Shop the Supreme x Nike Air Max 98 collection online, supremenewyork.com, April 28 and in Japan locations on April 29. The Air Max 98 shoes and Running Hat will not be sold in Supreme's New York, Los Angeles, London, or Paris stores. Last year, the iconic Converse Chuck Taylor All Star received an update with the revamped All Star II. Converse's classic silhouette was made more simple and more clean cut. Now, New York native photographer Timothy McGurr, better known as 13th Witness, takes the Chuck Taylor All Star II on a wear test throughout India. Traveling a total of 17, 774 miles centered around three cities, like Kashmir and Delhi, 13th Witness adventures in comfort from the streets of New Delhi to the foothills of the Himalayas thanks to the Chuck II. Along the way, the photographer captures people, objects, settings, and life in 20,179 photos on seven different cameras. Watch 13th's eclectic experiences as part of Converse's "#readyformore" series below. The last time Supreme and Nike joined to collaborate on a sneaker the canvas was an Air Jordan 5 and unveiled by Japanese magazine SHOES MASTER. Half of that process is replicated as the mag debuts pictures of the new Supreme x NikeLab Air max 98. Initially, red, all-black, and beige snakeskin pairs surfaced on the internet, foremost being the red pair due to its announcement by NikeLab on Instagram. Now, the official nature of print media premieres the entire Supreme x NikeLab collection, which includes another colorway added to the three, navy. 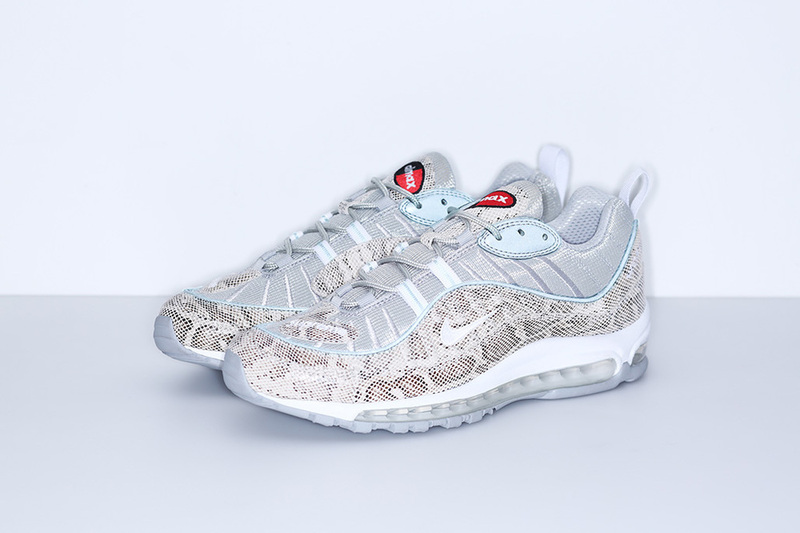 Whenever the special Air Max 98s release, they will feature 360-degree reflective piping, shiny patent leather, and a color blocking scheme contrasted with silver metallic mesh never before used on the sneaker. Supreme detail on the Nike shoe hits along the heel courtesy of the phrase, "WORLD FAMOUS," decidedly appropriate for both brands. No news is available yet on when the shoes will arrive. 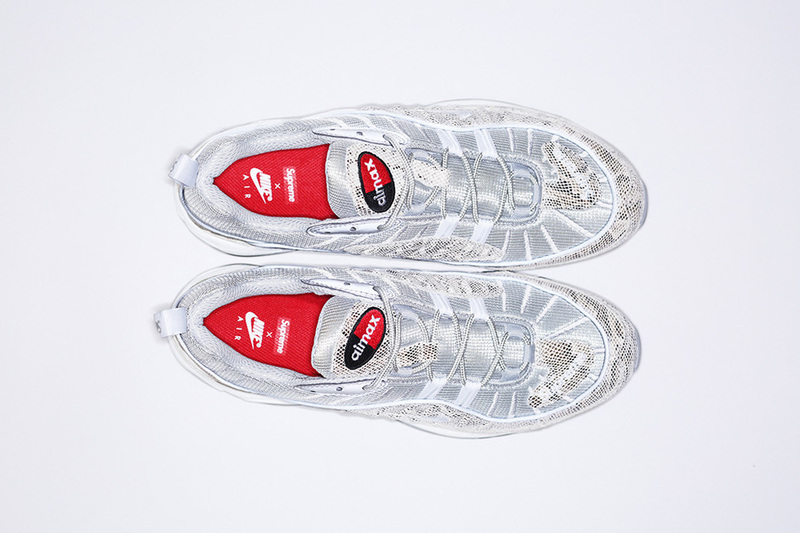 Stay posted for more details on the Supreme x NikeLab Air Max 98 collaboration.